My practice involves the representation of businesses and individuals in business formation and operation, contract, estate planning/probate, real estate, labor/employment, and related litigation matters. I am also the Solicitor for the Village of Centerburg and provide advice to other municipal clients, including the City of Westerville, on a variety of topics. The best part of my job is establishing a relationship of trust and confidence with my clients. I strive to provide practical legal advice with a good measure of humor and enthusiasm. I thoroughly enjoy being an attorney in central Ohio and being a part of the firm of Metz, Bailey & McLoughlin. 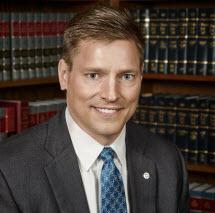 I began practicing law in Jacksonville, Florida following law school. In Jacksonville, my practice focused exclusively on labor and employment law. Today, I still maintain my Florida Bar license, which is convenient for clients with Florida property or plans to reside in Florida upon retirement. In fall 1998, my wife, Mashawn, and I decided to return to Ohio. At that time, I accepted a position with Schottenstein, Zox & Dunn in Columbus. In 2002, I resigned from partnership with SZD to join Metz, Bailey & McLoughlin. A few personal facts: my hometown is Wapakoneta, Ohio; Mashawn and I have two daughters, Jessica and Jansen; I am a member of the Westerville Sunrise Rotary and am on the Board of Trustees for the Westerville Area Chamber of Commerce (Chair 2010); and I am a dedicated and loyal Cincinnati Bearcat fan, having played football for the University of Cincinnati on an athletic scholarship.